All CADCA training is based upon SAMHSA’s Strategic Prevention Framework (SPF) Model, which consists of 5 steps, Assessment, Capacity, Planning, Implementation and Evaluation. Assessment is the process of gathering and analyzing information about needs and resources in order to gain an understanding of the scope and context of the impaired driving problem in the community. This information should be collected using both quantitative and qualitative methods, and should include archival statistics as well as first-hand anecdotal data from a variety of local sources. 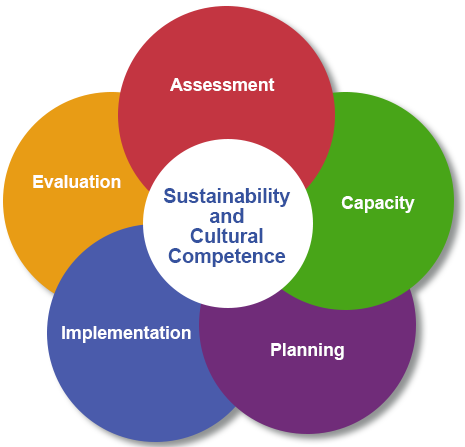 The assessment informs prevention planning and decisions – forming the basis for developing a model of change and for selecting programs, practices or policies that are relevant to a given community. It is a process, rather than a single event, resulting from the efforts and input of multiple community stakeholders. A collaborative approach encourages community involvement in prevention efforts. specific, identifiable and actionable local conditions that create risk for impaired driving. current policies and gaps in policies to address the problem. After completing a community assessment, coalitions must build the capacity needed to develop and carry out a comprehensive community plan to address the local conditions and root causes that contribute to the impaired driving problems they have identified. All coalitions need similar kinds of capacity to engage partners, stakeholders, and populations, maintain high levels of commitment, and organize their work effectively. Are all the relevant stakeholders involved? Does the coalition have a good understanding of the impaired driving problem, root causes, local conditions identified in the community assessment? Is the coalition aware of the best prevention practices, programs and policies to address them (e.g., NHTSA’s Countermeasures that Work)? Are coalition members committed to sharing the work involved in implementing strategies to make population-level change? Do we have the necessary resources (e.g., financial, human)? Do we have the necessary organizational structure and functioning? During the Planning stage, coalitions develop comprehensive, logical, data-driven plans to use the capacity they have built to target the impaired driving conditions identified through the assessment phase. Creating a comprehensive response to identified community concerns is the central task of coalition work. Comprehensive interventions are those that use multiple strategies in multiple sectors to change the conditions that make impaired driving in the community more likely. Coalition members need to have a thorough understanding of the strategies at their disposal. They need the ability to select interventions with proven effects and then to adapt these interventions to fit the local context. Further, coalition members must be able to develop unique local interventions based on their understanding of community needs and resources. Key processes during this phase include the development of a coalition logic model that shows the connection between the identified impaired driving problem, its root causes, local conditions, and associated data measures. From this logic model, the coalition develops a strategic and action plan that identifies clear objectives for change and outlines the interventions / strategies that will be used to reach the objectives. Finally, a concrete action plan for each intervention spells out specific tasks with timelines and identifies coalition members responsible for each task. The strategic and action plan is rolled out during the Implementation phase. During this time, the coalition takes care to ensure that the selected best practices are implemented with fidelity to the original design or with appropriate adaptation that fits the community but stays true to the research basis of the intervention. For example, a community may implement high visibility roadside sobriety checkpoints that are scaled down in size and cost to fit the smaller size of the community and its resources for enforcement. Guidelines for “low-staffing” sobriety checkpoints will be more practical for some communities compared to others. Coalitions should also follow any available research of practice guidelines about “dosage” of interventions, that is, how many and how often strategies are implemented. For example, one important strategy in a plan to prevent impaired driving among youth is to reduce access to alcohol from retail settings by implementing law enforcement compliance checks, or minor decoy operations. In 2005, a research study reported that the effects of these operations “decays” in about 3 months. This underscores the need for a well-planned schedule of operations and coordinated media outputs to create visibility and increase perception of being cited even during the time periods between the actual operations. Evaluation of efforts to reduce impaired driving help the coalition improve its work, coordinate more effectively, and be accountable to participants, funders, and the community. Evaluation of coalition work is fundamentally different from program evaluation in that it measures change at the community or population level. identifying stakeholders and stakeholder concerns that must be addressed. justifying conclusions, facilitating coalition understanding and use of findings, communicate findings effectively with stakeholders and the broader community.